Guyana's President, David Granger and Non-resident Ambassador of the Swiss Confederation to Guyana, Mr. Didier Chassot. during a meeting at the Ministry of the Presidency in Georgetown, Guyana. Non-resident Ambassador of the Swiss Confederation to Guyana, Mr. Didier Chassot, said Tuesday that Guyana is becoming the ‘land of opportunities’ as he noted that with the development of an oil and gas sector and the pursuit of the Green State Development Strategy (GSDS), the nation is an attractive destination for investment. 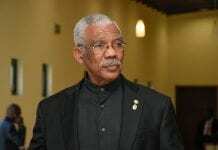 Guyana’s Ministry of the Presidency in a press release said following a meeting with President David Granger, the Swiss Ambassador, who is based in Venezuela, said that in addition to his meeting with the Head of State, he is also in Guyana to explore and expand on areas of collaboration between the two countries as well as opportunities for investment for Swiss and Guyanese investors in both countries. 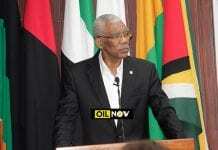 “We… know that Guyana is going through or about to go through a transformative period thanks to the oil findings and this could have a tremendous impact on the whole country and Guyana is becoming a land of opportunities so we are also very keen to develop the cooperation on the economic aspect. This morning, I had a meeting with Go-Invest [Guyana Office for Investment] precisely to have a briefing on what the opportunities would be for Swiss investors and for the business community to come to Switzerland. Very recently, an agreement on the promotion and protection of the investments between Guyana and Switzerland came into effect so this gives the business communities in Guyana and Switzerland a good legal framework so we want to develop the cooperation,” he said. According to the Ministry of the Presidency, Ambassador Chassot also noted that Switzerland acknowledges the strident efforts Guyana has been making in its pursuit of ‘green’ development. During a meeting between President Granger and former President of the Swiss Confederation, Ms. Doris Leuthard on the side-lines of the Minamata Convention on Mercury in Geneva in 2017, strengthening of the cooperation between the two countries in matters of the environment were discussed. 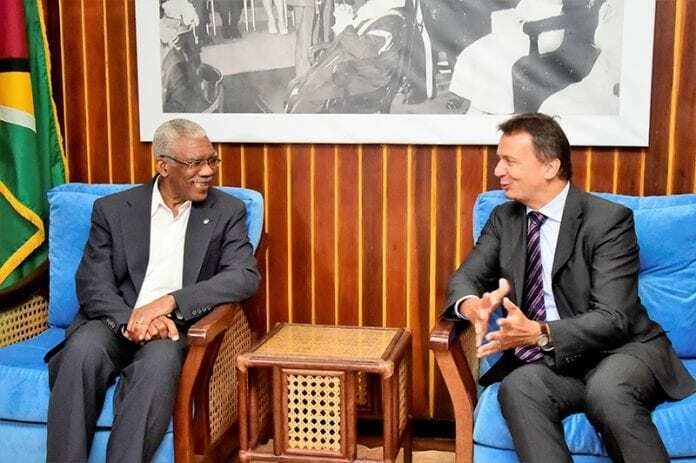 In this regard, the Swiss Ambassador said that the country looks forward to the transfer of its expertise and experiences to Guyana as it has a common ‘green’ vision to combat the effects of climate change and global warming and create a more sustainable planet. “We are trying to build on this exchange. We identified several areas of possible cooperation. We know of the commitment of Guyana and the President himself, with regard to the environment and its protection, the ‘green’ economy and we believe that there is ground for cooperation and exchange of expertise. Certainly, there is expertise and experience we can share and I am sure we can be able to develop something concrete on a bilateral level. The President has spoken about the rich biodiversity that Guyana has and the richness of the environment and this is indeed something that has to be preserved not just for Guyana but the whole world and Switzerland is willing to contribute to these efforts,” he said. Ambassador Chassot has also met with the Caribbean Community (CARICOM) Secretariat to discuss areas of collaboration and cooperation particularly in the area of disaster risk management and building resilience to natural disasters. “One of the areas of possible cooperation that we have identified is disaster risk reduction, disaster management, disaster relief and resilience. The region has been affected by hurricanes in the recent past. It is very likely that similar events will occur in the future again and Switzerland already has a commitment in those specific issues in the region. We would like to develop cooperation here in the region with CARICOM and member states,” the Swiss Ambassador noted. Some of the rain forest may be slightly affenter by discovery of oil.